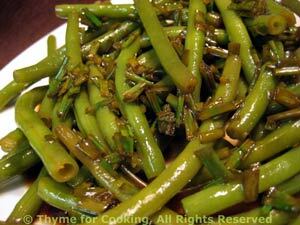 Green Beans with Lemon and Soy Sauce, quick and easy vegetable recipes. Top and tail and beans. Cut in 1 1/2inch (4cm) lengths. Put in a small sauce pan with an inch of water. Bring to a boil over medium heat. Turn down to low and simmer until done - about 10 minutes. Drain beans and put into a serving bowl. Melt butter in same pan.